IT'S not what FFA boss David Gallop wanted to be talking about on the day the Socceroos unveiled the 26-man squad that would carry a nation's hopes at the World Cup in Russia next month. But it's the price you pay for advertising. Tim Cahill's position in the squad had been a focal point as arguably our greatest ever player waited to discover whether his lack of recent playing time would be penalised by new coach Bert van Marwijk. 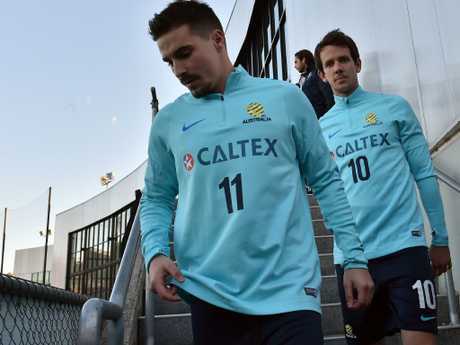 In-form Scotland-based striker Jamie Maclaren loomed as a real threat to Cahill, but any fears our record goalscorer would miss out on a fourth consecutive World Cup were eased when he was preferred to the former Perth Glory and Brisbane Roar marksman. Only Maclaren's nearest and dearest likely felt truly aggrieved at the decision, given Cahill's record in big games over more than a decade, but the situation grew more uncomfortable following an opportunistically timed advertising campaign announcement. Before the ink was a dry on van Marwijk's teamsheet, Socceroos sponsor Caltex and Cahill revealed a number of its petrol stations would be rebadged as Cahilltex as our national team embarked on its campaign. Jamie Maclaren (front) was overlooked. The timing might have worked for Caltex, but it was at best awkward for Gallop. He was forced to defend the selection of a legend, instead of celebrating what is a remarkable achievement. "I say have a look at Tim Cahill's track record," Gallop told reporters on Tuesday. "I don't think anyone can mock the fact that he's in the 26." But that didn't stop it from happening. Fairfax soccer journalist Michael Lynch said the problem with the campaign was it would "make football fans think the fix has long been in for Cahill to be selected irrespective of his form, fitness, sharpness or readiness". AAP reporter Vince Rugari called the campaign "crass" but also called for calm. "I think we need to can the conspiracy theories that (Cahill) is/would be getting picked for $$$ reasons btw," Rugari tweeted. "Crass as 'Cahilltex' is - particularly on the day our most in-form (overseas) striker is overlooked - not even FFA would stoop to those levels. 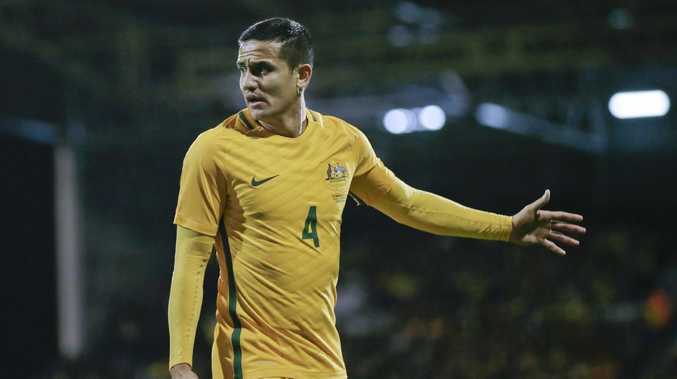 "(Cahill) is in cos he is a big game player who's always produced when his country has needed him to, and a big dressing room influence to boot." As for Cahill, he said he was "proud to be partnering with Caltex in a fun way". "For Caltex to rename itself in my honour is truly humbling," Cahill said. "There is no greater motivation heading into the biggest competition in our sport - let alone the world - than having an all-Aussie company and the rest of the country right behind our squad. "I am lucky to have had several defining moments across previous FIFA World Cup campaigns, and I'm looking forward to giving it another crack in Russia this year." Macaltex just doesn't have the same ring to it, we guess.